During the 1500s AD, the Utes had not yet seen any European invaders. They were still living in Utah and Colorado the way they had been living before. In the 1630s, a few Spanish explorers came to Ute territory and so people saw white men for the first time. The Utes were interested in these mens’ horses. 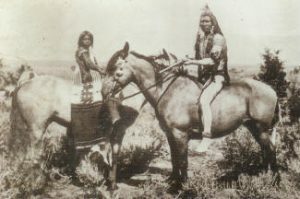 After the Pueblo Revolt in 1684, the Ute were able to trade with the Pueblo people to their south, in New Mexico, to get horses for themselves. Now that people had horses to ride, they made many changes in how they lived. The Ute people got together under one leader more often, instead of living in separate small bands of hunter-gatherers. The Utes hunted bison on the plains. They traded with the Spanish to their south in ways which were good for both the Spanish and the Ute people – the Spanish got fresh bison meat, leather, baskets, and furs from the Ute, and the Ute got metal things like axes and knives, wool cloth, and bridles for their horses. Ute people also fought more wars once they had horses, with each other, with their Paiute neighbors, and with the Pueblo people living in New Mexico. They were generally the enemies of both the Spanish settlers and the Pueblo people who were under Spanish control. They also fought with Navajo and Apache people, sometimes on their own, and sometimes as allies of (on the side of) the United States government. Ute people were upset when more and more white settlers began to move into their territory. They tried to fight off the settlers, but the United States Army came to help the settlers. 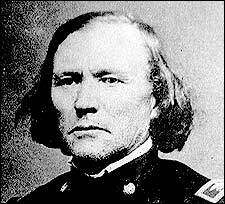 The leader of these troops in 1854 was Kit Carson, who gave the Utes blankets full of smallpox viruses so that many Utes died of smallpox. 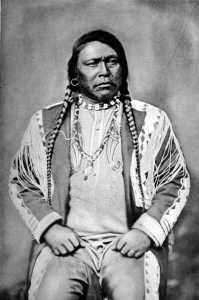 Chief Ouray, who took over leadership of one group of Utes when his father died in 1860, tried to find a peaceful settlement with the white settlers, even going to Washington D.C. to meet with President Hayes there. But the fighting continued anyway. By the 1890s, Ute people had lost a series of wars with the United States Army. As the bison died off, too, the Ute couldn’t get by hunting bison anymore. They were forced to move onto reservations on bad land, in deserts or rocky areas. Americans named the state of Utah after the Ute people in 1896, but by then the Ute didn’t rule it anymore. They didn’t have enough land to live by hunting and gathering anymore, and they couldn’t travel around to trade anymore, so many Ute began to farm and raise cattle or sheep on the reservations. Today many Ute people are farmers or ranchers. Cite this page: Carr, K.E. Ute get horses – American history. Quatr.us Study Guides, August 14, 2017. Web. April 25, 2019.